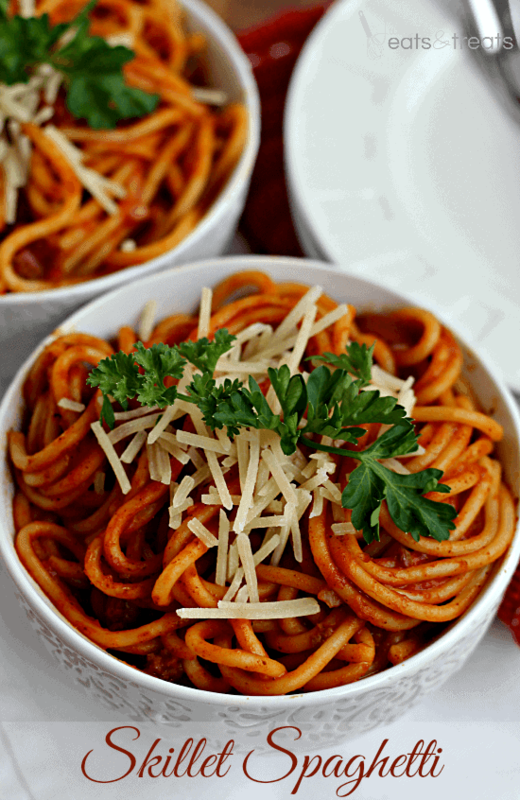 Skillet Spaghetti ~ Quick, easy homemade spaghetti! Only uses one skillet! When I try a new recipe on my family, which is quite often I study their faces quite intently. I watch for any indication they love or hate it. Like this recipe for Baked Spaghetti Casserole – which they loved! I tell you, it’s part of my research! Another thing I pay close attention to is if their plate is clean and mostly importantly if they go back for seconds. Technical research I do for all of you to know if a recipe is blog worthy right? My research on my end of the deal is also quite technical. It’s called, can I make this on a weeknight with minimal effort while entertaining a child that wants attention and is hungry. Aren’t you impressed by this research I do? I’m proud to report that this amazing Skillet Spaghetti passed both tests with flying colors! Another thing my research proved was that it only takes one skillet to make, which is amazing because I don’t know about you but I HATE dishes. If you are one of those lucky women that have trained their hubbies to do the dishes kudos to you. Do you mind leaving me quick note at the end of this post on how to do this? Much thanks! This Skillet Pasta has a homemade spaghetti sauce, which might scare you, but please don’t let it! 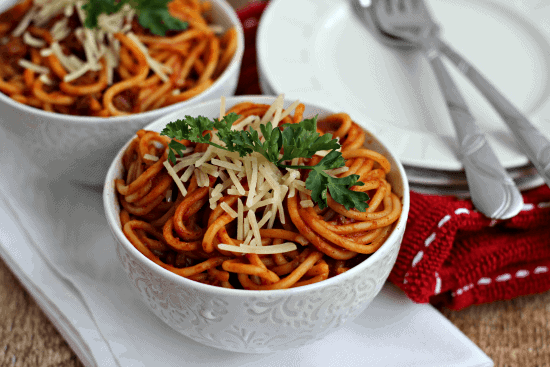 Grab your Contadina tomato paste, spices like chili powder oregano, garlic salt, dump it in the skillet with your pasta and you have an amazingly flavorful spaghetti that will have everyone cleaning their plates off and going back for seconds. Try this amazingly easy, flavorful dish today and join the Contadina #cleanplate club along with my family! 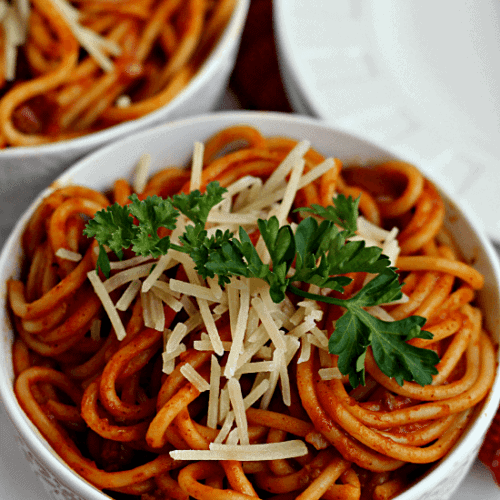 Quick, easy homemade spaghetti! Only uses one skillet! In a skillet, cook ground beef until no longer pink. Drain greased off of hamburger. Add water, juice, tomato paste and seasonings and bring to a boil. Reduce heat and add spaghetti. Cover and simmer on low heat for 30 minutes, stirring frequently or until spaghetti is cooked through. Sprinkle with Parmesan cheese and serve. Do you have to post this recipe on a Monday, and not a WEDNESDAY? I went to a spagetti supper last Wednesday, and it was GOOD. I do the same thing. I’m constantly asking my husband “what do you think” and “do you like it”. I should just start handing out surveys’ to the family after each recipe! I think this would be a true winner in my household! We love pasta! Yes! A survey. Wonderful idea! YUM! Love one pot meals! Definitely adding this to my list of things to try ASAP. Me too they are such a life saver! Sounds easy and delicious! Must try! This looks like a quick and delicious dinner, can’t wait to try it! You and I both girlfriend! I’ll try some tonight. I always cook my pasta sauce in a skillet. I have been making this since the 1960’s. I found the recipe in a magazine. Making this right now,waiting 30 mins and it’s mine!! Hope you enjoyed it Judy! Well, I made this. Not our favorite. The sauce for us was way to think. Of course, it could have been our noodles. We use only angel hair. So I bet it was probably that. The look of the final dish reminded my hubby of the canned stuff. We all still ate it, taste wise, still good. You can feel just a hint of spice at the back of the throat, from the chili powder, but so, so mild. Unfortunately this for us will not be a repeat.